Log in here to view your pets records. We have a walk-in vaccine clinic, NO Appointment NEEDED! Home Delivery of medications and pet nutrition. 10% discount off select services. 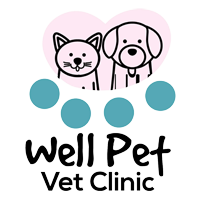 Well Pet Vet Clinic is a primary care,Veterinary Family Practice. We provide comprehensive medical, surgical and dental care -- with an emphasis on Preventative Health Care. We offer a wide range of diagnostic procedures through in-house testing and the use of outside laboratories. We also work closely with local specialty practices for additional diagnostic and treatment options. The facility includes a well-stocked pharmacy, in-hospital surgery with CO2 laser, digital x-ray, ultrasound and therapeutic laser capabilities. 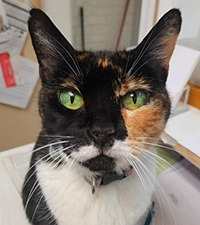 At Well Pet we strive to offer not only sound advice, but also optimal veterinary care, thus allowing you the enjoyment of your companion for a maximum number of years. Our job is not only to treat your pet, but to also help you learn how to keep your best friend happy and healthy. We have a number of resources for you to learn about how to take better care of your pets. Browse around and look at our articles and pet videos. The best veterinary care for animals is ongoing nutrition and problem prevention. If you want to ask a question call 925-427-4300 or email us and we'll promptly get back to you. Our Pittsburg veterinarian office is very easy to get to, and you can find directions on our Contact Us page. You can also subscribe to our newsletter which is created especially for Pittsburg pet owners. In between your veterinary visits, your pet will benefit from you reading these free informative articles. At Well Pet Vet Clinic, we treat your pets like the valued family members they are.